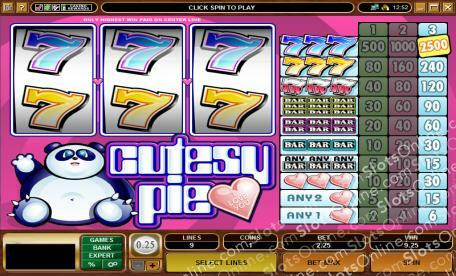 Cutesy Pie the panda bear is sad because it's best friend hasn't won enough money yet on the slot machines. Click here to play! Who is Cutesy Pie's best friend you ask? Why, you are! Couldn't you tell from Cutesy Pie's big smile when she sees you and the heart candies she brings. They say 'I Love You' for a reason, you know! Well, for forgetting that you are Cutesy Pie's best friend, you'll have to make it up to her by winning big on the Cutesy Pie slots. Playing 1 coin will put her in a better mood, but what she'd really like is to see her best friend win a 3-coin jackpot. Then you and Cutesy Pie could go for ice cream everyday, and everyone knows that panda bears LOVE ice cream! Uh oh! Cutesy Pie is getting lonely without you around. You'd better go keep her company on the Cutesy Pie slots. Win big and Cutesy Pie will jump for joy!